Reading, studying, and talking about literary works helps us to make sense of the world around us. 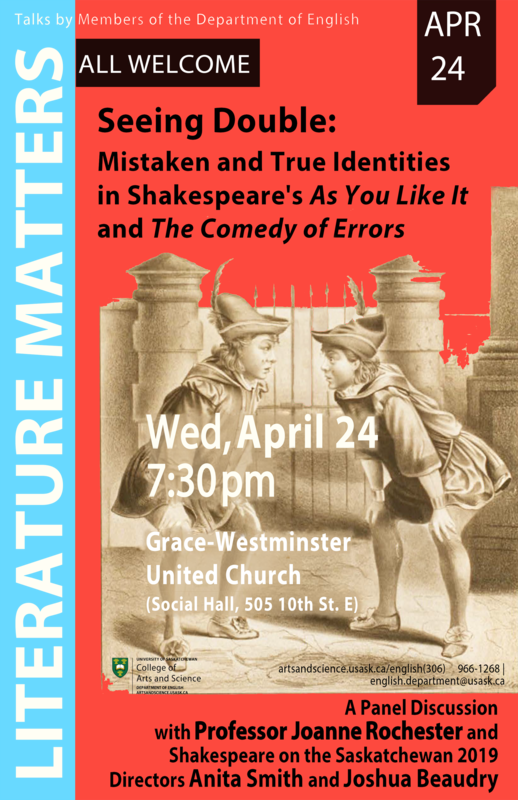 Since 2012, the Department of English has sponsored its literature in the community series, Literature Matters, featuring talks about our research for the Saskatoon community. Presenters are members of the department, including professors, sessional lecturers, and graduate students. All events are held on Wednesdays between September and May at 7:30 p.m. in the social hall of Grace-Westminster United Church, 505-10th Street East, Saskatoon. Everyone is welcome. October 24: Professors David Parkinson and Lisa Vargo, “How Does Your Culture Shape Your Reading of Literature?” With a fun practical exercise. November 28: Professor Yin Liu,"How to Find Your Way Around a Medieval Book" With pictures.